This fall, the Commons team has been busier than ever, setting up nearly 600 new course websites, blogs, and ePortfolios. WordPress continues to impress with its latest upgrade, allowing students and faculty to create great online spaces for their discussions, assignments, and research. This is just one example of what a class can do with a Commons blog. If you are interested in integrating these tools and exercises into your syllabus, please email commons@georgetown.edu. We’re happy to help! Posted October 26, 2015 by Katie Gach & filed under CNDLS. The Commons team has been quite busy setting things up for Spring. Since the first week of the new semester, we have set up over 285 individual sites for professors and students. What are you hoping to accomplish with your Commons site this semester? Once you’re finished, share it with us, and we may feature it here in a few months. As always, please send questions and feedback to commons@georgetown.edu. Posted January 27, 2015 by Katie Gach & filed under CNDLS. The Georgetown Commons system is now running WordPress 4.0.1. Along with more blue in the dashboard color scheme, you will notice the new media library, easier video embedding, and a text edit window that automatically adjusts as you write. The improved media library provides a more pleasant user experience when adding images to your blog posts: infinite scroll, the choice to view items in a list or grid, and the ability to search for items by name. The pop-up Edit Media window now has arrow keys to allow for quick scrolling between items to edit. This means you no longer have to save and click between images to adjust their size or caption. Embedding videos from YouTube, Vimeo and other sites should now work in the visual editor and no longer requires an embed code. Just paste the URL of the video into the visual editor, and the video should appear! If you tend to write long posts, you’ll benefit from the new text editing window. The scroll bar is gone, the window automatically enlarges as more text is added. and the menu bar (including the “Publish” and “Add Media” buttons) are now sticky, staying at the top the page as you scroll down. Finally, customizing your site and all its features continues to be easier (and easier to undo). Widgets now have their own customization panel in the Customize Theme menu, so you can try out new layouts and menu locations without making any permanent changes to your site. In the next few weeks, we will be adding brand new blog themes to choose from. Once they are available, another update will be posted detailing these themes and which options may be best for your class blog or portfolio. As always, if you have any questions, please email commons(at)georgetown(dot)edu. Posted January 7, 2015 by Katie Gach & filed under CNDLS, New Features. Last Friday, October 10, CNDLS, in partnership with the Department of Spanish and Portuguese, hosted a lecture to discuss innovative approaches to cross cultural Internet enabled collaboration in language learning titled "Teletandem: Aspects of Curriculum Implementation and Research Perspectives." Teletandem is a practice of collaborative language learning between pairs of speakers of different languages, facilitated by Voice over IP (VoIP) technologies. Students in ICC 227 engaging in Teletandem sessions - Photo by Peter Janssens, CNDLS Presented by João Telles, Associate Professor of UNESP visiting from São Paulo State University, and Michael Ferreira, Associate Professor and Director of Graduate Studies in the Department of Spanish and Portuguese at Georgetown, the lecture covered the core aspects of Teletandem and prospects for the future. With the help of CNDLS, Ferreira and Telles have been working to implement Teletandem practices in Portuguese classes at Georgetown since 2008. Earlier this year Ferreira received a one-year grant from CNDLS on the Initiative on Technology-Enhanced Learning (ITEL) to expand the scope outward from Portuguese to other languages including Spanish, Arabic, French, Japanese, Russian, and Turkish. “Tandem learning is very humanistic –very personal in a way.” – João Telles, Associate Professor of UNESP As Telles describes, Teletandem has three core principles: reciprocity, autonomy and a focus on one language at a time. Students share their cultures and languages with each other reciprocally growing comprehension and understanding in a resonant and deeply personal way. Telles emphasized that Teletandem partners are more than mere “pawns” in academic life; they take an active role and shoulder responsibility for their own work and the direction of the lessons. Focusing on single languages at a time in an organic setting leads to deeper comprehension. Students report enhanced cultural information about the partner's country, improved comprehension of the target language and more confidence to speak the foreign language. The cultural dimensions of Teletandem are equally important as the language component. In the lecture, Telles described the interactions as “online intercultural contact” not just between different languages but different cultures and even different socioeconomic class levels. Comparing and contrasting the daily lives in each partners’ countries leads to new understanding and fosters a rich dialogue. This method raises interesting questions and conceptions for expanding intercultural contact and interpersonal interaction, and subsequently making the process of language learning much more dynamic and complex. Ferreira and Telles, along with the others working in the area of Teletandem, are just beginning to explore the possibilities, and already finding the methods to provide rich avenues not just for learning language but also for collecting data to enable new forms of research in the area of language learning. CNDLS looks forward to further facilitating the evolution of this innovative program, and exploring the future of enhanced language learning and cultural exchange in a complex networked world. Last Friday, October 10, CNDLS, in partnership with the Department of Spanish and Portuguese, hosted a lecture to discuss innovative approaches to cross cultural Internet enabled collaboration in language learning titled “Teletandem: Aspects of Curriculum Implementation and Research Perspectives.” Teletandem is a practice of collaborative language learning between pairs of speakers of different languages, facilitated by Voice over IP (VoIP) technologies. Presented by João Telles, Associate Professor of UNESP visiting from São Paulo State University, and Michael Ferreira, Associate Professor and Director of Graduate Studies in the Department of Spanish and Portuguese at Georgetown, the lecture covered the core aspects of Teletandem and prospects for the future. With the help of CNDLS, Ferreira and Telles have been working to implement Teletandem practices in Portuguese classes at Georgetown since 2008. Earlier this year Ferreira received a one-year grant from CNDLS on the Initiative on Technology-Enhanced Learning (ITEL) to expand the scope outward from Portuguese to other languages including Spanish, Arabic, French, Japanese, Russian, and Turkish. As Telles describes, Teletandem has three core principles: reciprocity, autonomy and a focus on one language at a time. Students share their cultures and languages with each other reciprocally growing comprehension and understanding in a resonant and deeply personal way. Telles emphasized that Teletandem partners are more than mere “pawns” in academic life; they take an active role and shoulder responsibility for their own work and the direction of the lessons. Focusing on single languages at a time in an organic setting leads to deeper comprehension. Students report enhanced cultural information about the partner’s country, improved comprehension of the target language and more confidence to speak the foreign language. The cultural dimensions of Teletandem are equally important as the language component. In the lecture, Telles described the interactions as “online intercultural contact” not just between different languages but different cultures and even different socioeconomic class levels. Comparing and contrasting the daily lives in each partners’ countries leads to new understanding and fosters a rich dialogue. This method raises interesting questions and conceptions for expanding intercultural contact and interpersonal interaction, and subsequently making the process of language learning much more dynamic and complex. Ferreira and Telles, along with the others working in the area of Teletandem, are just beginning to explore the possibilities, and already finding the methods to provide rich avenues not just for learning language but also for collecting data to enable new forms of research in the area of language learning. CNDLS looks forward to further facilitating the evolution of this innovative program, and exploring the future of enhanced language learning and cultural exchange in a complex networked world. Posted October 15, 2014 by John Hanacek & filed under CNDLS. Professor Martin Irvine’s online-only CCT course, “Key Concepts in Technology and How to Use Them,” is slated for a fall 2014 launch. CNDLS is providing instructional design and other project development support. Funded by the second round of the Provost’s ITEL grants, Professor Irvine’s course is the first online-only, for-credit course in the CCT program. In the spirit of the ITEL initiative, this online course extends Georgetown’s resources beyond its current community and into the public. In addition to CCT and other Georgetown students, any qualified student or working professional can enroll in this course and use the course credits for a degree program elsewhere or for professional development. The main goal of this project is to provide a high quality, virtual learning experience to more students and prospective leaders than a course taking place on Georgetown’s physical campus could serve. To learn more about the course, you can access the promotional video produced at CCT. For more information about the development of this course, please read the Faculty Voice article on Professor Irvine from the most recent issue of The Prospect, CNDLS' publication on teaching and learning. To learn more about the course, you can access the promotional video produced at CCT. 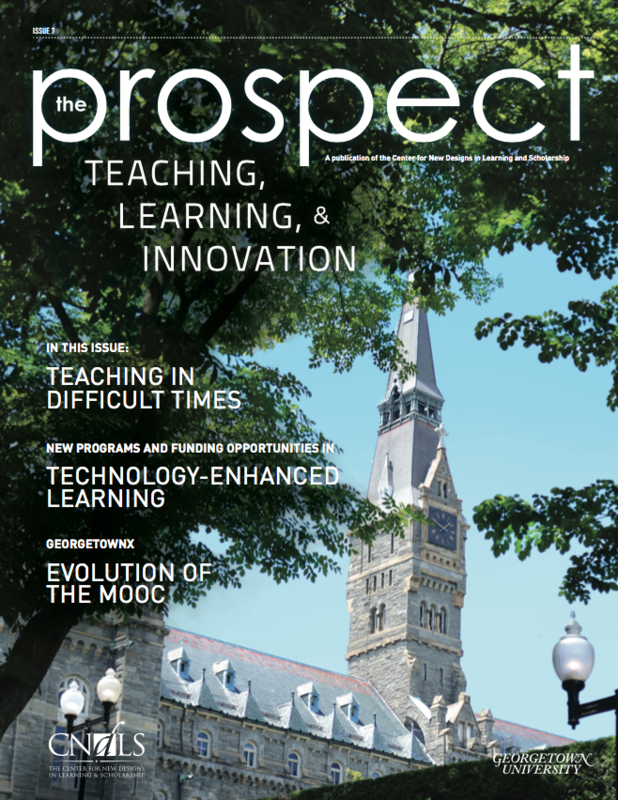 For more information about the development of this course, please read the Faculty Voice article on Professor Irvine from the most recent issue of The Prospect, CNDLS’ publication on teaching and learning. Posted June 11, 2014 by Anna Kruse & filed under CNDLS, Faculty Spotlight. CNDLS has recently partnered with Remark to pilot video annotation in several technology-enhanced learning projects taking place at Georgetown. One such project is the use of video annotation in GeorgetownX courses and in particular in Globalization: Winners and Losers. Globalization: Winners and Losers will next be offered as a Massive Open Online Course (MOOC) on edx.org in October 2014. Another annotation tool that CNDLS has been working with is Scrible. Scrible is a collaborative, online text annotation tool. For more information on these emerging partnerships, please contact Yianna Vovides. CNDLS has recently partnered with Remark to pilot video annotation in several technology-enhanced learning projects taking place at Georgetown. 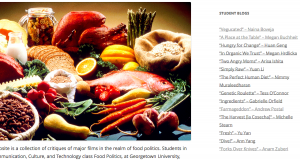 One such project is the use of video annotation in GeorgetownX courses and in particular in Globalization: Winners and Losers. Globalization: Winners and Losers will next be offered as a Massive Open Online Course (MOOC) on edx.org in October 2014. Another annotation tool that CNDLS has been working with is Scrible. Scrible is a collaborative, online text annotation tool. For more information on these emerging partnerships, please contact Yianna Vovides. Posted May 19, 2014 by Anna Kruse & filed under CNDLS, New Features, Uncategorized. In this workshop, Stephen and Wardzala used case studies as well as guided group and individualized exercises, to help an audience of faculty and study abroad professionals enhance learning experiences in short-term programs by developing learning goals, incorporating culture into the curriculum, viewing the host/home culture through reflection, and exploring student learning through assessment. The workshop included rubrics for evaluating multimedia projects—based on the VALUE rubrics—that Stephen and Lisa Donatelli (OIP) developed last year as part of Stephen’s ITEL project, “Mind the Gap.” This project seeks to document the transformational aspect of study abroad programs by bridging students’ study abroad experiences with their on-campus academic careers in Washington, D.C. Specifically, the project was interested in measuring the following as expressed online: what students were learning abroad; how they were connecting with local populations and organizations; how they were connecting their study abroad experiences with their previous and future studies at Georgetown; and what lessons students were learning about their roles as global citizens. To integrate students’ experiences abroad with their Georgetown studies, Stephen collaborated with Rob Pongsajapan and Yong Lee at CNDLS to implement blog assignments, Omeka museum projects, and ePortfolios into her courses. Alongside these technologies, Stephen developed three specific rubrics; her goal in creating assignments tied to rubrics was to improve student learning through reflection, integration, and visibility. 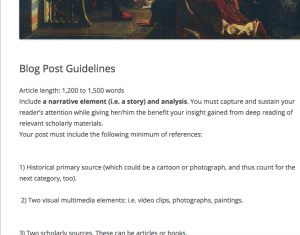 Blogs allow students to reflect on and think critically about their experiences as they live them; the Omeka museum becomes a growing collection of past and present cohorts’ exhibits; and the ePortfolio serves as a platform for students to publicly integrate their abroad experiences with their field of study and on-campus learning. Posted March 19, 2014 by Caitlin O'Leary & filed under Announcements, Publications and Presentations.